Saucony Liberty ISO are stability cushioned running shoes. The brand new Saucony Liberty ISO has been released following good performance from its counterpart for neutral runners Freedom ISO and trying to get significant market share among moderate pronation support running shoes. Current approach from Liberty ISO is already well-known to justify high price tag: modern and attractive design, plenty of cushioning using latest technology (EVERUN), good response (just 4 mm drop) and lightweight. Those looking for a more traditional proposal might find the Guide ISO worth a try. Upper is quite similar to Freedom ISO one, with forefoot made of adaptable engineered mesh following current trend of open fabrics (like PrimeKnit from Adidas or FlyKnit from Nike) promoting superb breathability and morse dense in the rest. 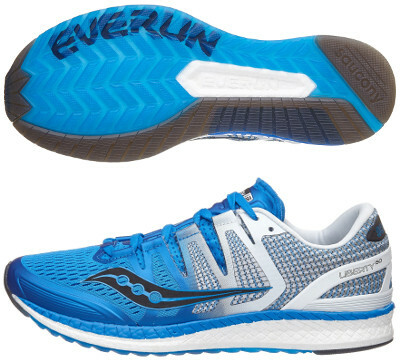 Main difference with other ISOFIT systems available in premium Saucony models out there like Hurricane ISO 3 is that it gets integrated into the upper of the Liberty ISO and not any more as external and rigid cage. In order to improve stability there is an external plastic piece (Support Frame) surrounding the heel which also displays the official name of the running shoe. Although official marketing speech from Saucony states that midsole is enterely made of EVERUN (like Adidas does with Boost™ in Adidas Supernova ST), there is embedded actually a TPU piece in the internal side to contribute to support moderate pronation in a progressive way. As expected, outsole is nearly the same already unveiled in mentioned Freedom ISO featuring TRI-FLEX configuration with triangular lugs for good traction and quick response but crystal rubber has been reinforced in more exposed areas to increase durability.